Republicans in California's heavily Democratic 35th Congressional District are a lonely lot, represented in the House by one of the nation's most liberal members, Maxine Waters. Nonetheless, GOP voters in gritty South Central are being treated like Hollywood celebrities in the presidential primary campaign, despite numbering only 15 percent of the area's registered voters. California Republicans have instituted new rules for awarding delegates to their 2008 national nominating convention, prompting their party's White House hopefuls to pursue a counterintuitive strategy of seeking GOP votes in Democratic strongholds like Waters' district. They're preparing to barrage the relative handful of Republican voters with phone calls and mailings seeking their support. Another target: the 34,000 Republicans in San Francisco's 8th Congressional District, represented by House Speaker Nancy Pelosi, the country's top-ranking Democrat. The payoff - three convention delegates per district - is the same the candidates would receive if they prevail in heavily Republican districts, but the cost and energy needed to compete in the Democratic districts is much less than a more widespread media campaign. "It's a lot easier to communicate with individuals when you need only 8,000 votes to win that area, versus when you might need 80,000 or 90,000 votes to win," said Hector Barajas, a spokesman for the California Republican Party. Leavening the primary battle are the state's liberal absentee-voting rules. Ballots will begin arriving in the mail the first week of January, just as Iowa and New Hampshire kick off the nominating process. Wins in the early voting states could produce a bandwagon effect when California's votes are tallied following the Feb. 5 primary. Campaign aides project as many as 20 percent of the ballots will be returned the first week after they are mailed. "It's not about carrying all the momentum through the 5th, but if you come out well from Iowa, that helps you in a real way here," said Rob Stutzman, a top California adviser for Republican Mitt Romney. In the past, the California GOP awarded convention delegates on a winner-take-all basis. The candidate getting the most votes statewide got all the state's delegates. This election cycle, the party changed to apportionment by congressional district. Some 170 convention delegates are up for grabs in the February primary: three to the winner in each of the state's 53 congressional districts, for a total of 159; and 11 on an at-large basis for the top vote-getter in the state. Another three convention delegates will be top party leaders unpledged to any candidate. Democrats follow a more convoluted program of apportioning delegates based on the specific congressional district won. In the past, the state's June primary and the GOP's winner-take-all delegate system meant most candidates visited California only to raise money, not to stump for votes. But now, the primary is in February, and by winning fewer than 15 congressional districts, a Republican candidate can garner more delegates than the 41 up for grabs in the leadoff Iowa caucuses. The new rules have prompted candidates like Romney, former New York Mayor Rudy Giuliani and Rep. Ron Paul of Texas to focus not only on traditionally Republican areas such as Orange and San Diego counties, but also a half-dozen Democratic strongholds in Los Angeles and San Francisco. 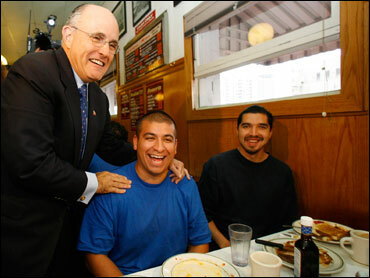 In Giuliani's case, the strategy is especially important because he has not placed the primacy on Iowa and New Hampshire that have Romney and Sen. John McCain, R-Ariz. Former Tennessee Sen. Fred Thompson, another presidential candidate, is focusing on South Carolina, which will follow Iowa and New Hampshire. All the candidates hope for a wave of success on Feb. 5, when as many as 20 states - including California - will vote. The congressional district strategy doesn't make a lot of sense from a general election perspective, but in a primary battle solely for the hearts and minds of GOP voters, it is a model of efficiency. In Pelosi's district, for example, Democrat John Kerry beat President Bush in the 2004 general election by 84 percent to 14 percent. Across San Francisco Bay in Alameda County, within the 9th Congressional District represented by Democratic Rep. Barbara Lee, the 2004 vote was 86 percent to 13 percent. But each district also represents a clear focus for the GOP primary candidates. Of the 340,000 registered voters in Pelosi's district, 10 percent, or about 34,000, are registered Republicans. If there were 100 percent turnout on primary day, hardly likely, a GOP candidate would need no more than 17,000 votes to gain a majority. In Lee's district, there are 317,000 registered voters, of which 9.8 percent, or about 31,000, are Republicans. Similar demographics exist in four Los Angeles districts. In the area around Los Angeles International Airport represented by Waters, there are 231,000 registered voters. Of that, 36,000, or 15 percent, are Republicans. A GOP candidate would need no more than 18,000 votes to win the district - and gain the convention delegates. By contrast, the 48th Congressional District in nearby Orange County has 200,000 registered Republicans. "Sending a mailer to those individuals versus the other one is a lot more effort. And yet they both have the same value in terms of delegates gained," said Barajas, the state party spokesman.